Takeaway: OSHA's list doesn't change much year after year, but we can all do our part to reduce the numbers. It’s a list that changes little from year to year. Every time the latest list of most-cited OSHA standards comes out, it feels a bit familiar. But it's an important reminder of the safety issues that we still need to work on and that are responsible for more than 4,500 worker deaths each year. The physical and machine-based work that is common across jobsites means that danger is always present. The list of violations reveals two types of deficiencies: inadequate physical protection and lack of communication. Fall protection is the leading cause of death on worksites, and it is a protective equipment issue. 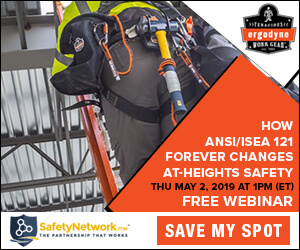 The protective devices needed to keep workers safe from falls range from PPE like harnesses and lifelines through to site-specific features like guardrails and toe-boards, safety nets, stair railings, and hand rails. Fatal falls and injuries also factor into scaffolds and ladders, which appear as number three and number seven on this list. Respiratory protection is fourth on the list. Breathing is often taken for granted as a workplace activity. Its dangers don't appear as obvious as those from tools, machinery, or vehicles. Additionally, the damage often only shows up hours or even years after exposure, making its cause harder to pinpoint. For example, silica dust and asbestos are respirable hazards whose effects only show up long after workers have punched the clock. In many cases, workers are offered paper face masks, which are inadequate protective devices for these risks. Even full-face respirators are intended to be used as a second level of defense after appropriate dust prevention procedures, like vacuuming and water sprays have been put in use (learn more about Reducing Silica Risks at the Construction Site). Of particular interest is hazard communication (number two) and lockout/tagout (number five). These both point to communication issues related to adequate signage, signaling, and education. This list – as well as all subsequent lists of the next ten or hundred OSHA citations – are not mere items on a board somewhere. Each citation represents workers whose lives have been cut short or seriously damaged by violations of clearly defined safety regulations. In most cases, the reasons workplace safety regulations are violated come down to time, money, or inadequate compliance. In terms of time, many project managers find themselves having to make critical choices. Whether the project is a one-off, or a daily occurrence, there are often many reasons why it might be tempting to hurry things up. It's easy to fall behind on a project, leaving managers the choice to complete it late or to cut corners. Unfortunately, with many competing pressures, they don't always choose the safest route. In other situations, the causes are purely financial. A company might have to cut costs to be accepted as a vendor, for instance. However, in many circumstances, the costs of failing to comply with safety make the cost-cutting less of a bargain than it first seemed to be (see Connecting the Dots: Safety and Profitability to learn more). Industries like construction are filled with employees who have little say in their working conditions. Even if they have in-demand skills, they might be reluctant to raise their voices, even to a shop steward, for fear of retaliation. Anywhere that workers are worried they might lose their job if they raise an issue is a workplace where safety violations can continue without check. Organizations like OSHA aim to speak for these workers by mandating policies, behaviors, and physical requirements that contribute to the goal of a 100% injury and fatality-free worksite (see The Journey to Zero! for a related discussion). In addressing these issues, OSHA also speaks on behalf of employers, since the cost of adequate preparations, equipment, and practices pales in comparison to the costs of litigation and fines. But as a regulatory body, OSHA can only do so much. It is up to management and safety professionals at each individual workplace to ensure the safety of workers and promote it as an important value. Any successful project has project management at its heart. Great project management is about writing the history of the project before it happens, using charting and estimations to factor in every element – even the unexpected. Budgeting for safety equipment, training, practices, and inspections is an essential component of any project plan. Quality assurance is important, too, since training isn’t worth much unless the employees can prove they have learned and that they can use what they have learned (see The 5 Metrics EHS Departments Should Be Tracking). The silver lining here is that OSHA's list is a list of violations. That means it points to preventable actions. It's important to communicate the importance of safety clearly and frequently with workers so that they know the procedures, that their safety is valued, and that they won't face retaliation for trying to protect themselves or their co-workers from an unsafe workplace. OSHA's list of violations might never go away, but the numbers that come along with it can. Every owner, safety professional, and worker can do their part to reduce the annual rates of injuries and fatalities. Instead of acting like accidents are a fact of life, it's time for us all to act based on the goal of achieving a zero-accident workplace.